Buzz Builder: "FINALLY! Something Your Audience Wants … That They've NEVER Seen Before! 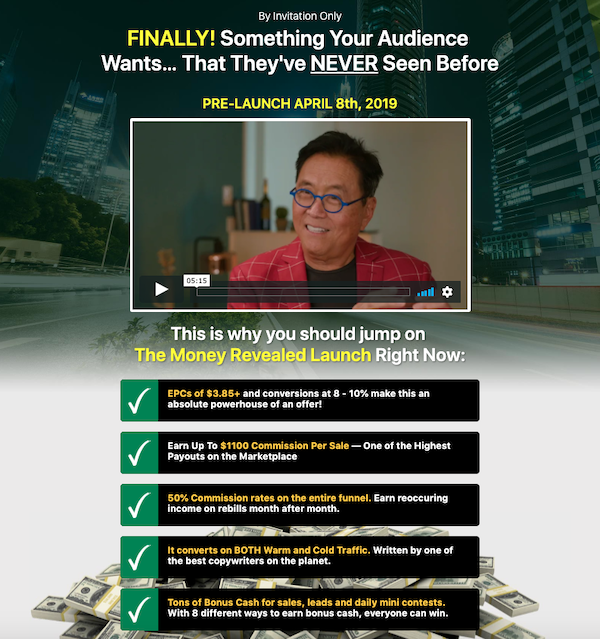 EPCs of $3.85+ & Conversions @ 8-10% - Earn up to $1100 Commission Per Sale - 50% Commission on the Entire Funnel - Converts on BOTH Warm & Cold Traffic - Tons of Bonus Cash for Sales, Leads & Daily Mini-Contests - Exclusive Prizes for the Top 10 Affiliates"
Dr Patrick Gentempo, Jeff Hays, Nate Hopkins + Michael Hearne - Money Revealed Launch Affiliate Program JV Invite Page. Check Out All The New Product Launches & Evergreen Affiliate Programs On Our Popular JVNewsWatch Calendar Down Below. "What Is JVNewsWatch, And How Can Using It Benefit My New Product Launch Or Evergreen Affiliate Program?" Back In 2006, Well Known JV Broker Mike Merz Sr Added A JV Product Launch Calendar To The JVNotifyPro.com Homepage To Give His Brokering Clients Extra Exposure Attracting JV Partners For Their New Product Launches, As Well As To Keep All His Clients Aware Of Other Launches So They Could Avoid Competition For Specific Days. As The Calendar Gained More And More Popularity, Mike Sr Was Constantly Bombarded With Requests From Clients To Post And Modify Listings … Which He Did By Hand, As Well As Offers In Vain From Partners That Weren't Clients To Pay For Listings. Something Had To Be Done, So Mike Sr Came Up With The Idea Of Using A Site He Originally Co-Owned With Long Time Friend, Partner + IMNewsWatch.com Founder Mike Mograbi, Named JVNewsWatch.com, To Automate The Listing Process, Put Control Of The Listings In The Merchant's Hands, Allow Both His Clients And JVNP Partners To Submit Their New JV Product Launch Invite Or Evergreen Affiliate Program Offers, Add Even More Functionality To The Listings Themselves, While Not Changing The Basic Appearance That Made It The Net's Most Popular JV Product Launch Calendar In The First Place. Brought To Life By The Technical Prowess Of His Well Known In His Own Right Son, Mike Merz Jr … We Proudly Present, The JVNewsWatch JV Product Launch Calendar. *JVNP 2.0 Partners That Upgrade To VIP Receive One Free JVNewsWatch VIP Listing Credit Each Month They Remain A VIP In Good Standing (A $47 Value). Click Here For Details. It is expected and recommended that you perform due diligence when getting involved in any venture that may affect you, your business, it's prospects and customers. It's also assumed that, as an Online Business Owner, you're capable of running your own business using common sense, logic + exercising personal responsibility. Here's A Sampling Of The Popular New Product Launches JVNotifyPro Has For You In April 2019. You Must Be Logged In To Access The JV Invite Pages On The Calendar Below. Please Log In Here. Not A JVNP 2.0/JVNW Partner? Join Here ... Free. Your Upcoming Launch Isn't Listed? Click Here. IMPORTANT! - To Participate In The JV Offers/Affiliate Programs On This Calendar, It Is Essential That You Have Affiliate Marketing Experience. If You Do Not, We Recommend You Learn The Ropes Here => Free Affiliate Marketing Training. Calendar Listing Designation Key: VIP = Listing Owner Is A JVNP 2.0 VIP Partner. NEW = Listing's JV Page Has Been Live For 10 Days Or Less. HOT = Listing's JV Page Has Registered 100 Unique Clicks Or More. NYA = Listing's JV Page Not Yet Available. Please Check Back At A Later Date. The Merchant Has Not Made A Buzz Builder Or JV Page Available Yet. Please Stop Back At A Later Date. Earn up to $195 & LIFETIME commission by simply promoting Fred Lam’s $1.99 audiobook! Plus, there’s over $100,000 in prizes up for grab! Best part, Fred is having a Control Your Destiny Contest where ANYONE can walk away with HUGE prizes and HUGE commissions! This is going to be one of the biggest launch this year and will be the right fit for ANYONE. Check out Fred’s JV page now (link below)! More New Product Launches And Joint Venture Announcements Will Be Added As They Become Available. Legal - The Owner Of This Site May Earn An Affiliate Commission If A Purchase Is Made Through Their Affiliate Link. Not A Partner? Sign Up Free Today.